Drove through a driving rain to get to ol’ Osceola County Stadium here this morning and with an hour before game time the tarp is still on the diamond. The rain has let up, though, and I don’t think a rainout is in our future. Chatted with manager Cito Gaston about a few things today. One being that Vernon Wells, Travis Snider and Rod Barajas — all circled on the travel roster for today — did not make the trip to Kissimmee. Wells hurt his left wrist yesterday and had a cortisone shot, out for a few days. Snider jarred his left knee yesterday and Barajas is nursing a sore back. Gaston said he doesn’t believe any of the injuries are serious and the disabled list hasn’t been discussed for any of the players at this point, even with the season right around the corner. Well broke the same wrist last year and Cito said the center fielder hurt it during his last at-bat yesterday. Also talked about Shaun Marcum and Dustin McGowan, who continue to make their way back from injuries. It’s been tossed out there that Marcum might be ready by August or September, but Cito says he doesn’t see the point in bringing him back before next year. As for McGowan, he continues to be behind and Cito said he might be out of the picture until next year as well. On the hill today is Ricky Romero, making his last bid for a job in the rotation. It’s down to Romero, Brad Mills and Scott Richmond. Gaston still isn’t showing his hand in terms of which way the Jays are leaning for the Nos. 4-5 slots. I’ve been saying Richmond/Mills all along, but now I could just as easily see them going with Mills/Romero. It’s spitting rain here at Ed Smith Stadium, but not really enough to call this game I wouldn’t think. Then again, I’m not a weatherman. I’m hoping it goes on as planned, because I’m looking forward to seeing if Ricky Romero can really pull himself back into the hunt for a rotation job. Manager Cito Gaston still wouldn’t say whether Matt Clement would be gretting another start, but he didn’t sound confident that was going to happen. Gaston keeps noting that the Jays are reaching the point where the innings need to go to the guys who might be heading north, and I’d find it hard to believe Clement is still in the mix. So, we’re still left with Scott Richmond, Brad Mills and Ricky Romero. Gaston said that there is no hesitation on Toronto’s part to hand a job to Mills due to the fact that he has no career innings at Triple-A. That doesn’t mean Mills has a job, just that his lack of AAA innings isn’t going to be an obstacle. Gaston did say that, in the event that three lefties (David Purcey, Mills and Romero) wind up in the rotation come Opening Day, Jesse Litsch might be moved into the No. 3 hole to break up all the left-handers. Gaston said, if that happened, he’d be sure to talk with Litsch to assure him that it wasn’t a demotion at all. Marco Scutaro has returned to the Jays and Gaston said he’ll be in the lineup tomorrow. Same for Travis Snider, who didn’t make the trip to Sarasota today as originally planned. Snider is coming back from a sore left knee and Gaston said he was playing in a Minor League game as a DH back in Dunedin today. Good news on the Vernon Wells front. Jays skip Cito Gaston said Wells is scheduled to make his first Grapefruit League appearance of the spring as a designated hitter on Friday in Dunedin. Wells is coming back from a strained left hammy, suffered Feb. 23. Gaston said Wells will play center field for maybe three innings on Saturday, will be off on Sunday and then will DH again on Monday. The hope is that Wells will be fine to play center by Opening Day. He played in a Minors game again on Thursday with no issues. Gaston said Scott Rolen (stiff back) is scheduled to take some batting practice tomorrow and he should be OK in a day or two to play. As for Travis Snider (left knee), Gaston said he’s going to be given a few days off, but the injury isn’t considered serious. Rod Barajas and Alex Rios, both back from the World Baseball Classic, will be in the lineup tomorrow in Dunedin as well. Gaston also said that Scott Downs looked good in his Minor League appearance on Wednesday. Downs is skedded to pitch one inning on Saturday in his first Grapefruit League game. Stopped by Dunedin Stadium this morning for batting practice. The Jays hold BP at home on days they play the Phillies in nearby Clearwater. And glad I did roll over there, because one of the best moments of the spring occurred. Roy Halladay headed over to the snack cart and reached into the bucket of gum to grab a few pieces. As he walked away, Doc accidentally dumped the entire bucket and its hundreds of Double Bubble pieces all over the ground. Without as much as a flinch, Doc kept walking and left the mess in front of the clubhouse exit. Not 10 seconds later, rook Travis Snider heads over and gets on hands and knees and begins picking up all the gum, completely knowing his role. As he was reaching under the cart to retrieve every last piece, Doc walked by and had the biggest grin you’ve ever seen the guy have. 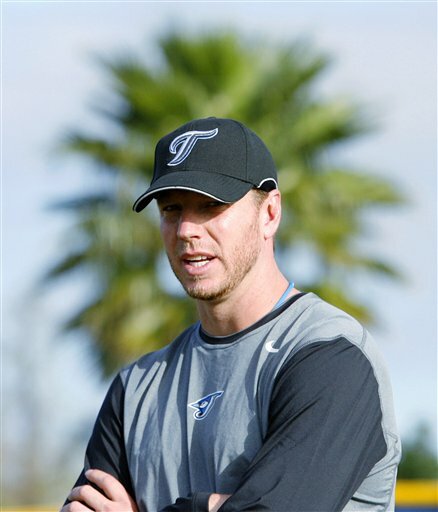 “You’re all over it, Snider,” Halladay said with a laugh as he headed out to the field. Rod Barajas is back in camp after Mexico was bounced from the World Baseball Classic. Alex Rios should be around tomorrow or the next day now that Puerto Rico is out as well. USA! USA! USA!